Born: 13 April 1870, Bristol, England. Died: 13 January 1947, Mossel Bay, South Africa. John H. Whaits, Anglican clergyman, received his religious training at St Pauls mission house in Burgh, Lincolnshire, and at St Augustine's College, Canterbury, during 1890-1891. He came to the Cape Colony in 1894 and was ordained as a priest of the (Anglican) Church of the Province of South Africa the next year. 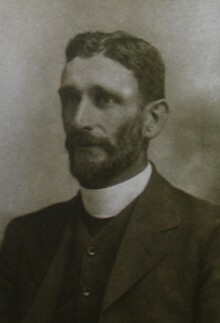 He served as curate at Stellenbosch for five years, and then at Simonstown and as assistant curate at St Barnabas Church, Cape Town, before being appointed rector of Prince Albert in 1903 and subsequently of Laingsburg (1909), Beaufort West (1910) and Graaff-Reinet (1914). In 1924 he was promoted to archdeacon of George and served as rector of Oudtshoorn until he retired in 1937. He married Katherine M. Legg of Stellenbosh, with whom he had three sons and two daughters. Whaits's interest in fossils may have been stimulated by the fossil collector J.L. Cairncross*, who lived at Prince Albert when Whaits arrived there. Furthermore, in 1905 Dr Robert Broom*, professor of zoology and geology at Victoria College, Stellenbosch, became honorary keeper of vertebrate palaeontology at the South African Museum, Cape Town, and started recruiting amateur fossil collectors who could supply him with fossils from the Karoo. Whaits developed into the most successful of Broom's fossil hunters over the next few years. He was a dedicated collector who developed an extremely sharp eye for detecting fossils. However, his field work entailed some expenses and he had a limited income. The director of the museum, Dr L.A. P?ringuey*, offered to refund his field expenses in return for his contributions and Whaits accepted this offer. While at Prince Alfred Whaits served also as railway chaplain, which meant that he travelled regularly and could search for fossils in many places. He presented his first specimens - reptilian remains from Fraserburg Road - to the museum through Broom in 1905, followed by regular contributions until 1924. Altogether 156 specimens collected by him still form part of the museum's fossil collection. His contribution was particularly important with regard to the carnivorous mammal-like reptile group Therocephalia, as he collected about a third of all the specimens belonging to this group then known in South Africa, including a beautiful skull belonging to the genus Scylacosaurus (1909). The therocephalian genus Whaitsia was named after him, but has since been renamed. He also collected most of the well-preserved skulls of the herbivorous family Endothiodontidae known at the time. In 1913 Broom took a number of fossils, mostly specimens that Whaits had collected, overseas and sold them to the American Museum of Natural History. As a result the director rescinded Broom's honorary keepership and banned him from the museum. Despite this setback Whaits continued his contributions. In 1912 Whaits sold a series of fossil reptiles to Albany Museum, Grahamstown, including some new species that were described by Broom in the Records of the Albany Museum (1913). More specimens followed the next year, including one of the most complete skeletons of a Dicynodon known at the time. During 1912 and 1914 he also presented reptilian remains from the Beaufort beds to the McGregor Museum, Kimberley. In addition to mammal-like reptiles from the Karoo strata Whaits also collected fossil marine animals, particularly brachiopods and trilobites from the Bokkeveld beds, and presented them to the South African Museum in 1907. He also occassionally sent in some other specimens, for example, a wingless locust from the Karoo and some stone scrapers from Laingsburg to the South Africam Museum in 1909, and stone artifacts to the McGregor Museum in 1914. Whaits became a member of the South African Philosophical Society in 1907 and was still a member of its successor, the Royal Society of South Africa, in 1917. Albany Museum. Report, 1912, 1913. Cape of Good Hope. Report of the trustees of the South African Museum, 1905-1909. General directory of South Africa, 1903, 1908-1911. McGregor Museum, annual meeting: Curator's report [for 1912, 1914]. Diamond Fields Advertiser, 2 April 1913, and - March 1915. (Photocopies received from McGregor Museum, Kimberley). National Automated Archival Information Retrieval System (NAAIRS). . Documents relating to Whaits, John Henry / Whaits, Reverend J.H. Royal Society of South Africa. Transactions, 1910, Vol. 1, and 1917, Vol. 6: Lists of Fellows and members. South African Philosophical Socielty. Transactions, 1907, Vol. 17, list of members. Union of South Africa. Report of the South African Museum, 1912.